Hi, everybody! 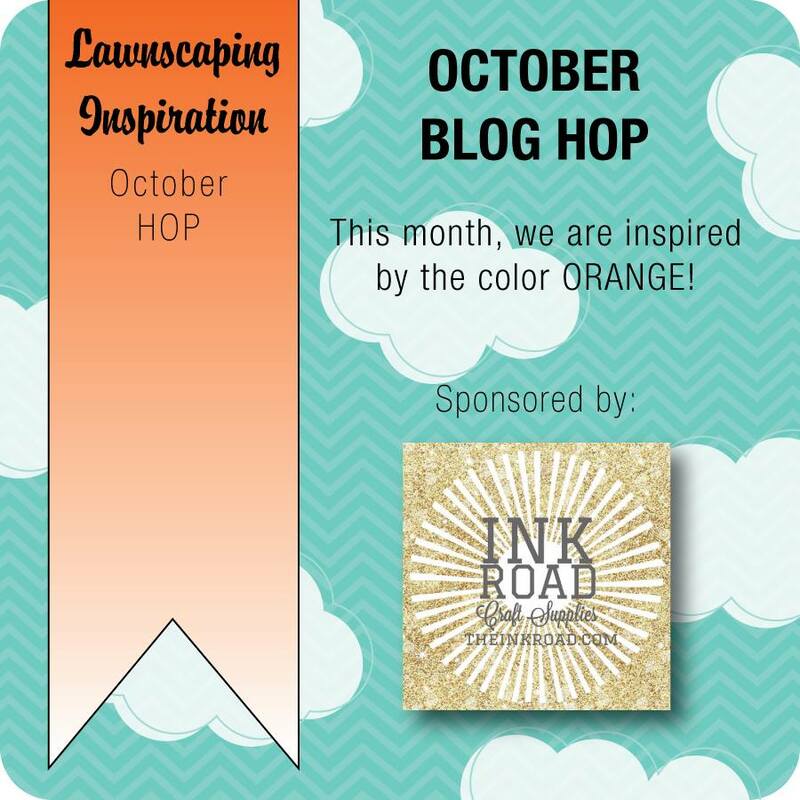 It’s time for our monthly Facebook Inspiration Team blog hop at the Lawnscaping Challenges blog! You’ve probably arrived here from Kim’s blog, but in case you’re starting here, you can find the full list of the blogs in today’s hop at the bottom of my post! This month’s hop is once again being sponsored by The Ink Road! We’ll pick a winner from all of the comments left on our hop to receive a $25 gift certificate to The Ink Road! Our inspiration color for this month’s hop is ORANGE, so I made a pair of fall holiday tags: one for Thanksgiving and another for Halloween. On the Thanksgiving tag, I combined the mice from Lawn Fawn‘s “Thankful Mice” stamp set with the “So Thankful” set. Both tags feature a heat embossed background strip using the “Gingham Backdrops” set. The scene on the Halloween tag combines stamps from “Monster Mash” and “Spooktacular” sets. I tied a length of Candy Corn Lawn Trimmings twine to the top of each tag. Don’t forget to leave a comment for me before you hop over to Angel’s blog! Make sure to include your e-mail address so we can contact you if you’re chosen as the lucky winner of a $25 gift certificate from The Ink Road! A cup of fall-themed inspiration at the Lawnscaping blog! The gingham background looks wonderful. First thought it was ribbon or a stencil and wonderfully surprised to see it is a stamp. Both tags are so cute. These are sooo adorable !! Cool gift tags!! Love the gingham background!! Oh my stars! My Halloween infatuation with the little monsters is off the scale with the tag you’ve created! And the little mice? EEEE…a whole of cuteness and creativity happening here! Beautiful tags! Love those mice totally adorable!!! Oh my goodness, these tags are darlling! Love them both! Super cute tags!! I love the plaid background. Love the strip of a background! So cute and love the background! Omg!! I want that gingham stamp!! I love love love any kind of checked background! Guess that’s the “southern” in me. I have a tractor stamp that background would go perfect with! lol! Aw, super cute! Love the critters and the monsters! Great background too! Such sweet tags! Love the plaid heat embossed background! The images on both tags are just too cute! Great coloring! These tags are such a wonderful idea, and they are really adorable too! Such sweet tags! It’s amazing how color can really change the appearance of the bg. I love these cute little mice!! Cute tags! 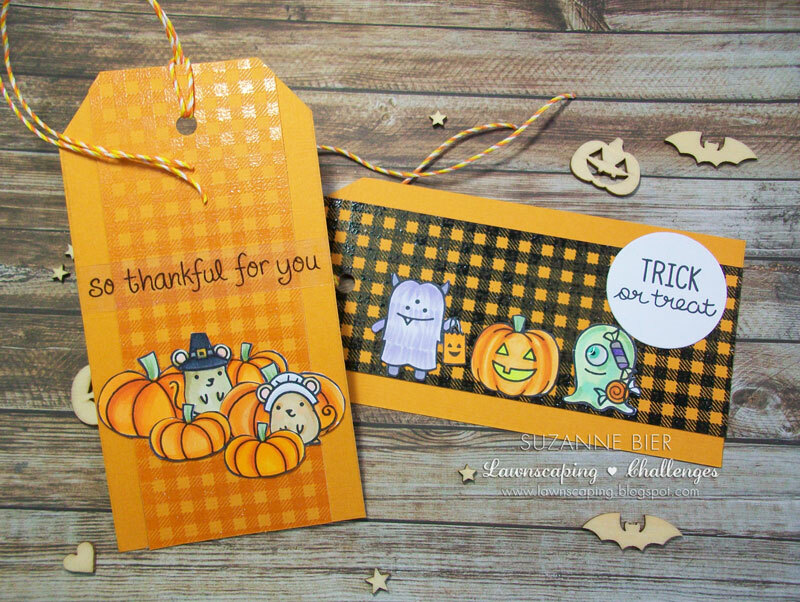 Love the gingham background on the colored papers and the adorable Halloween stamps you used! Gorgeous tags!! I łove the use of orange and the gingham pattern!! Love, love, love these beautiful Halloween and Thanksgiving tags! So sweet! Really adorable and creative! Very inspiring!